Brooms are available in every household and also in different versions. With only 1 or 2 brooms, one can already play some games; with a few more you can play one or the other relay race. However, the broom should be durable and endure a lot; it must be expected that the broom breaks. If necessary, have a few spare broomsticks ready. If necessary secure them with angle irons as needed. 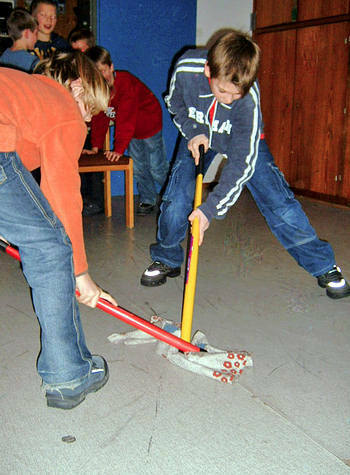 Broom games encourage skill and alertness towards other players. The objective is to balance the broom on the palm of her hand. Who can manage this task the longest? Alternative: a broom has to be balanced in each hand. The broom must be balanced over a certain distance. If the broom drops, then the candidate must go back to the beginning and start again. The broom is cast like a javelin as far as possible and is measured from the point of impact. A broom must be thrown through a bicycle tube, hanging 3 meters up in the air. A broom must be thrown into 4 marked circles, in four different distances. Each circle has a different score. Each player can throw 4x. Who can collect the most points? Who can create a small house numbers? Who can create the largest house number? One child rides the broom like a witch while at the same time trying to catch the other kids. Alternative: all kids ride the broomstick. One candidate stands on the broom, holding on to the broomstick. The objective is to cover a certain distance, hopping on the broom. As with stilts, one player stands with each foot on a broom. The hands hold onto the broomstick. The time will be clocked to cover a certain distance. The broom is placed across the shoulders. An assistant hangs a bucket of water on each the left and right side of the broomstick. The player must now cross the finishing line and empty the buckets into a bath tub. Then he returns to the starting point and the next player starts again with two buckets. A bucket of sand is evenly distributed on one square meter. The objective is to sweep the sand over a 3m finishing line and there, with the help of a dustbin, return the sand to the bucket. The time will be clocked. The winner is the one who could sweep the most of the sand back in his bucket. The amount or weight of sand will be measured. Take the difficulty up one notch, instead of tar flooring try it on grass. Option 1: instead of sand, larger stones can be pushed to the finishing line. Option 2: air balloons are placed on the playing field. Using a broom they have to be placed into a large pan/bath tub. The players divide into two groups, standing in a line to face each other. Each group holds one broom. A candidate lies on the broomsticks held by the other kids. On command the team is required to carry the kid on the “stretcher” over the finishing line. Alternative: the broomsticks are placed and carried on the shoulders. A great game for coordination and cooperation, where it is important that all kids run even without the candidate dropping down between them. The broom serves as a bat. A puck must be moved into the opponent’s court. Using a broom, a tennis ball or a balloon is moved through the cones – slalom – to the finishing line. The fastest team wins. Using the broom, a tennis ball must be hit or pushed through arches in the lawn. A steeply downhill running plastic film is continuously sprayed with the water hose. Using a broom the kids now try to push the water “uphill”, so that it can flow over the top, down into a bucket. After a certain time the water level will be measured. (Construction: 2- 3 tables are placed on a steady tub to create a slight drop. The tables are covered with a plastic film. From the approximate middle of the tables the water is sprayed on the tables using a water hose. 2 fighters, each on a pedestal facing each other. Both now try to push the opponent off the socket with the broom. A crate can serve as a pedestal. Potato sacks can be tied around the broom to minimize injury. 2 players hold 2 brooms in their hands. Now they carry objects (such as balls, balloons, filled sacks or wooden balls) from A to B. The fastest team wins. A broom is inserted through the sweater and pants. The candidate is required to run a certain distance. Alternative: 2 brooms are inserted in through the clothes. (One for each leg). This game can easily lead to injury if the candidate has a fall. The entire group lines up behind each other, jointly holding a broom firmly in each hand. On command, the group starts off to complete an obstacle course without letting go of the broom.